ExactTarget webinars are informative, convenient ways to bring you and your colleagues practical knowledge from leading Interactive Marketing experts. If you've got an hour (or less), ExactTarget's Inspirations and Solutions Webinar Series will give you hands-on, practical insights into growing and optimizing your Interactive Marketing campaigns. All ExactTarget webinars will include a presentation followed by audience Q&A. Recordings and other useful resources will be available following each webinar. Think You're the Average Consumer? Am I really that different from the average consumer? •Differentiate marketer and consumer digital behaviors. •Evaluate digital channels based on consumer preferences. •Avoid personal bias to better reach your consumers. It's time to stop making assumptions and start being relevant. 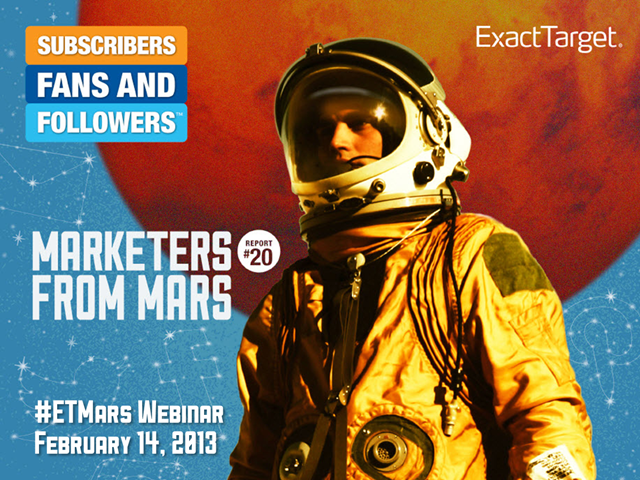 Hear straight from the experts by attending this webinar on February 14th, 2013.